A great experience. I should than my clinet Jangl for hooking me up with the opportunity to attend, thank you. This was my first confrence since TypeCon in San Francisco in 2005. The conference focused on how successful online communities and social networks build, grow and monotize. SkinnyCorp president and CEO Jake Nickell and chief creative officer Jeffrey Kalmikoff swear that they only start new projects if they think the idea is going to be fun. And not just fun to them, but fun to the members of their community. All of the company’s projects use community involvement in some way, and the Threadless model is its exemplar. Threadless.com is one of the best and most successful t-shirt shops on the web, and it has a thiriving community made up of artists, collectors and casual customers. Artists submit their ideas for t-shirt designs they think would be cool, community members vote on the designs and the highest-scoring designs get printed into shirts that are sold on the site. The company has two other successful online community sites: Naked & Angry, which prints products made from tiled patterns created and selected by the users, and Extra Tasty, a user-generated library of drink recipes. Some of SkinnyCorp’s other community ventures include iparklikeanidiot, Lunchtime Photo Safari, Me Everyday, and Poopface. Some of those sites aren’t around anymore, like poopface.com, which was a freeform image uploader. Any image uploaded to the site would be displayed until the next one was uploaded — each uploaded image over-wrote the one before it. It was a total mess but it was fun, so that made it worth it. 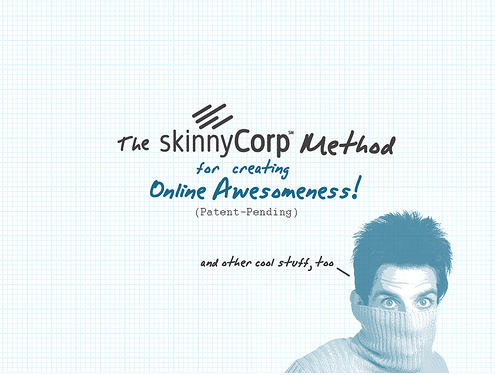 SkinnyCorp has a single guiding mantra: Your project is not good enough. The team keeps this in mind not only when preparing for a site launch, but also when the site has already met success.